Charities Supported by GeoFoam Concepts - A Division of Foam Concepts, Inc. Supported by GeoFoam Concepts – A Division of Foam Concepts, Inc.
Brea, CA – Melissa is a sweet, smart and active ten-year-old girl living with a variety of congenital disorders in which hypoglycemia is caused by excessive insulin. While this diagnosis affects her everyday life, Melissa does not let it get in the way of her being a kid. Like most ten-year-olds, Melissa loves all things Disney, including the music and her favorite movie, Frozen. She also enjoys things like playing tag, watching videos on YouTube, and her most favorite thing to do is ice skate! While Melissa has many interests, there was one thing missing from her day-to-day life: a dog! Melissa’s wish was to have a service dog that she could play with, love, take everywhere, and that could help notice when her blood sugar is low. She wanted a companion to be there with her so she would not be lonely while she is sick. 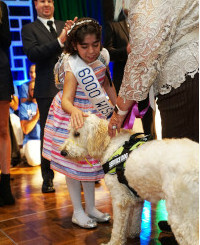 Melissa’s wish was granted as our 6000th wish at our Evening of Wishes Gala in front of our donors, volunteers, and staff. She was very surprised and excited when she finally met her dog, “Luna.” Melissa and her family are very grateful that her wish came true and are looking forward to the many memories that she will make with her new friend. Lake Forest, CA – Taylor is an energetic, outgoing and caring 7-year-old who loves pink, chocolate cake and music. Diagnosed with Ewing’s sarcoma in June of 2015, she endured months of treatment. Although she spent time away from her favorite things, she always turned to music to keep her spirits high. When approached by Make-A-Wish, it was no surprise that Taylor wished to be a singer! Taylor’s wish was above and beyond what she had imagined. Parenting OC Magazine featured the rising pop star on the cover of its April edition. With the help of OC Hit Factory, Taylor recorded her album which features songs “Shake It Off”, “Let It Go” and “Fight Song.” She then had her Album debut with radio DJ, Ellen K, on her morning show at KOST 103.5 – resulting in fans calling in to show their support. To celebrate Taylor’s album release, a party was held at Boathouse Collective restaurant. After a morning of pampering, the pop star was greeted at the restaurant by her fans and she walked the red carpet. After signing cd covers for all in attendance, she was able to relax and celebrate with those she loves most. Los Alamitos, CA – Kai is an energetic 13-year-old living with aplastic anemia. He loves orange colors, pasta and playing sports with his friends. 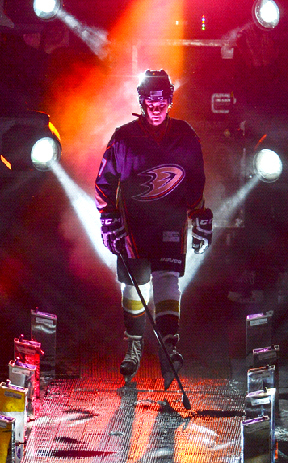 Recently, Kai developed a passion for hockey, specifically the Anaheim Ducks. When approached by Make-A-Wish volunteers, it was no surprise that this dedicated Ducks fan wished to be one himself and take the ice with the team and his favorite player Hampus Lindholm. To kick off his wish experience, Lindholm surprised Kai during his art class at school and invited him to practice. Surrounded by classmates, Kai accepted with a huge smile. The following day, Kai enjoyed a tour of the Honda Center and was taken to his very own locker which held a personalized Ducks jersey. He then suited up and took to the ice for practice with the team. Kai learned some tips from his favorite player and had a private one-on-one practice followed by lunch with the team. 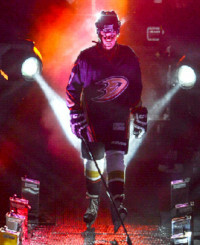 To top it off, the Ducks invited Kai to the season opener where he could walk the orange carpet and sign autographs for cheering fans. He was then surprised when the team told him to suit up and join them for the opening ceremony. Kai skated out onto the ice to thousands of cheering fans and was introduced as an honorary player for a day. “It’s been a really amazing experience,” said Kai of his wish. Nominee, a five-year-old girl who loves playing with her dogs and the color ping, was diagnosed with acute lymphocytic leukemia. Nominee’s one true wish was to be a veterinarian! 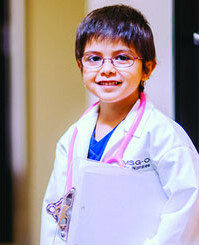 One the day of her wish, Nominee arrived at the Veterinary Medical and Surgical Group where she was presented with a lab coat, a clipboard and a pink stethoscope that matched her sparkly shoes. Nominee took a tour of the hospital and then got right to work! She started with routine checkups on cats and dogs by checking their paws and listening to their hearts. “Nominee wanted to treat her beloved pets with the same care and compassion she experienced during treatment,” said Nominee’s mom, Silva. Next, Nominee helped shave a puppy to prepare it for surgery, assisted with an ultrasound and even removed stitches from a dog that had previously had surgery. By the end of the day, “Dr.” Nominee was walking around the hospital like a professional, responding to her name being paged over the PA system and rushing off to greet her next four-legged patient. 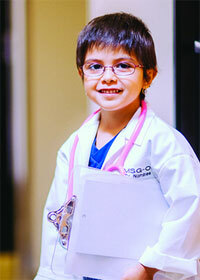 Santa Ana, CA – Raymond is a fun-loving little boy living with Langerhans Cell Histiocytosis, a type of cell disorder. Raymond, or “Ray Ray” as he is more known by, is a huge fan of football, but specifically of the Dallas Cowboys. 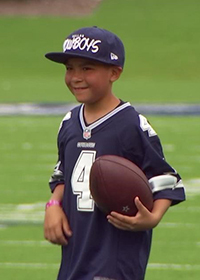 When asked what his greatest wish would be he said “I wish to meet Dak Prescott!” Raymond expressed that he feels a connection specifically to Dak because of Dak’s mother’s battle with cancer. He loves how he shows his support to his mother every time he makes a touchdown by blowing a kiss to her in the sky. When Raymond and his family arrived at The Star in Frisco, they were greeted by cheering fans, the Dallas Cowboys Cheerleaders, and the Rhythm & Blue Drum Line. 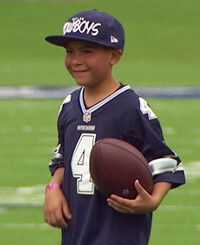 Raymond was given his own Cowboys Jersey with the number four on back to match his favorite football player. He was then welcomed into the press conference room where he answered questions from the “media” and was signed to an honorary contract. After his press conference, Raymond joined Prescott along with other Dallas Cowboys on the field to engage in some drills during day two of training. To top it all off, Raymond got to ride in style on “Jer Force One” a helicopter owned by the Dallas Cowboys owner. Raymond had a blast spending the day playing football with not only his favorite football team but his favorite player! Genesse is a sweet young girl who loves the color pink, Disney princesses, and playing outside with her twin sister. She is living with Acute Lymphoblastic Leukemia. 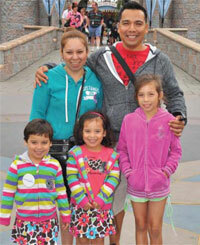 Genesse knew exactly what she wanted to wish for – a trip to Disneyland with her family! Genesse’s exciting wish began with an adventure at the Bibbidi Bobbidi Boutique. She received a royal makeover to look just like a beautiful Disney princess! She loved walking around Disneyland all day dressed like royalty. During her time at Disneyland, Genesse had front row seats at Mickey’s Soundsational Parade and the World of Color water show. One of her special memories was an individual meet and greet with the one and only, Mickey Mouse! One of Genesse’s favorite parts of her wish was dining with the princesses at Ariel’s Grotto. She was able to meet and talk to her favorite princesses, while enjoying a delicious meal with her family. Genesse and her family made unforgettable memories together. Her wish trip is something they will never forget! She is grateful to Foam Concepts, Inc., the Make-A-Wish Club of El Dorado High School, and Make-A-Wish Orange County and the Inland Empire for making her most heartfelt wish come true! Samantha’s wish came true on a beautiful morning at the Mission Inn in Riverside, which served as her castle for the day. She arrived by limousine, where a series of surprises awaited her. Samantha was whisked away to a room high up in her “castle” and was led a short time later down a spiral staircase inside the atrium. As she stepped down the twisting steps, she saw a crowd of people holding signs and cheering for her. Samantha was greeted by two princesses who then crowned her. After her coronation, she was led outside where a horse drawn carriage was waiting to take her on a ride through the city. 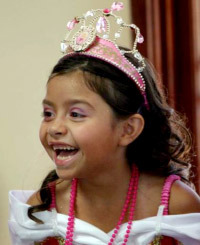 When they returned, Samantha and her family and friends were treated to a very special princess party. Samantha danced and ate slowly. Samantha, who is now in remission, and her family can now look back on this time in Samantha’s life as more than cancer treatments and hospital stays. Cheerful memories will fill their minds with the day that Samantha became a princess. They are thankful to Make-A-Wish and Foam Concepts Inc. for making her wish come true. Jessica is a brave 12-year-old who is battling a brain tumor. She has an enormous sweet tooth and loves anything that is purple or pink. Just as sweet as the cupcakes she loves so much, Jessica smiled and laughed as she was asked about her most heartfelt wish. Wanting to escape from the reality of her illness, this young lady asked to have a brand new game room fashioned in her house. She wanted to have a place specifically created for leaving burdens behind. A place to play games, watch movies and relax. When volunteers were finished decorating and preparing Jessica’s game room, it was time for the unveiling at her wish presentation party. She anxiously waited outside of the room. As she stepped into the bright new room, Jessica was captured by the glow of colors. Bright pinks and purples were displayed around the room as beautiful new decorations framed her new giant flat-screen TV and videogame gear. This precious little fighter covered her mouth to keep from squealing with joy as she took in the splendor. She was also surprised to see a brand new foosball table in the corner. Jessica will never forget her wish day, and will remember it with every moment she spends in her brand new game room – her very own haven. 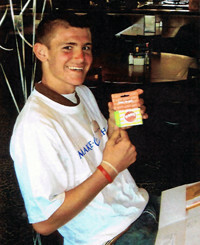 Irvine, CA – Austin is an intelligent and active young man who plans to become a professional athlete when he grows up. Because he is interested in his education and his sports career, he decided that he wanted to attend Orange Lutheran High School since they have an outstanding academic and athletic record. When Austin was thinking about his wish, he knew he wanted something practical that would help him in his future endeavors. For his most heartfelt wish he wanted to receive funding to help pay for his high school tuition. On the day of his wish presentation, Austin and his family went to his favorite restaurant, the Elephant Bar, for a celebratory meal. No fanfare was needed to make him any happier than he already was when he was told he would receive funding to attend Orange Lutheran High School. Austin told everyone that he was excited for the first day of school because he was looking forward to playing football, basketball and running on the track team. Yorba Linda, CA – Brielle loves vanilla cake and the color pink. In school she enjoys studying science, and she loves listening to music by her favorite Disney artists. By all accounts, Brielle is a typical young girl. However, she was diagnosed with cancer a few years ago and this, of course, caused a dramatic shift in her life. When the time came for Brielle to make her wish, her eyes lit up as she expressed that she wanted to go on a Disney Cruise. Unfortunately, due to Brielle’s cancer every time her wish date would arrive, she would not be strong enough to travel. After two years of medical ups-and-downs, she was ready to go on her wish. Brielle, along with her family, arrived in Orlando to board the Disney Cruise destined for the Bahamas. For the next several days, they enjoyed nightly entertainment, sun-filled days on the ship’s deck, and interactions with many Disney characters, including Donald and Daisy Duck, as well as Mickey Mouse. From the beginning to end the cruise was everything Brielle dreamt it would be and more. Back at home, Brielle continues to study science, eat vanilla cake, and listen to her favorite Disney artists. Now she has something extra to smile about, though. The memories she made with her family are a permanent reminder of the joy life promises. They brought peace for the moment and continue to provide. Brielle hope for a happier tomorrow. Her parents are so thankful for the Make-A-Wish trip they were able to experience as a family. They will forever be grateful to Foam Concepts who gifted their daughter with this trip…it was a dream come true for Brielle. 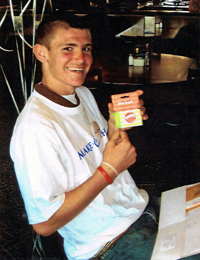 Lake Forest, CA – Sean is a courageous and admirable young man, currently living with brain cancer. Sean has an older sister and a twin brother. 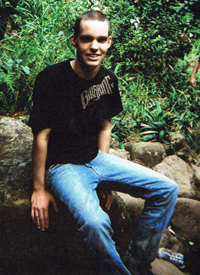 He and his brother are extremely active in boy scouts and as a result are extremely adventurous and outdoorsy. When our wish granters met with Sean, he wanted to wish for something that would allow him to both spend time with his family and go fishing. 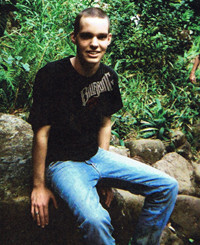 Wanting something different than the traditional camping trips he went on so often through the boy scouts, Sean decided upon a Hawaiian getaway. A wish party was thrown for Sean in the comfort of his home with his family and wish granters present. Pizza and drinks were had, and Sean was not only presented with his wish trip itinerary, but a backpack filled with a few essentials for his trip. He received two Active brand t-shirts, a Make-A-Wish t-shirt, and a tackle box filled with bait, hooks, and a brand new Penn 500L Reel! Needless to say, Sean was quite pleased. It was finally time for Sean and his family to depart on their Hawaiian getaway! Once there, the family went site seeing, hung out at the beach where they swam and snorkeled, went parasailing, and rode ATV’s. But Sean’s favorite part of the whole trip was when they all went out on an early morning fishing charter aboard the “Catch’em” where they saw some intense sport fishing. Sean not only had an amazing time, but he caught some big fish along the way. He and his family are very thankful to Make-A-Wish for giving them this wonderful opportunity they will not soon forget. 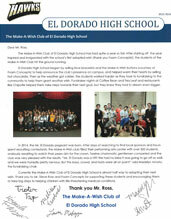 American Cancer Society American Red Cross National MS Society PHS Booster Club PYLUSD Marin Luther King Basketball W.Y.L.L.L.